A highlight of the Chicana/o Studies Program is the Taller Arte del Nuevo Amanecer (TANA), based in Woodland, the county seat of Yolo County about 15 miles from Davis. Through the partnership, UC Davis faculty and students bring college-going awareness to low-income students. Sometimes the community service reaches out beyond Yolo County. 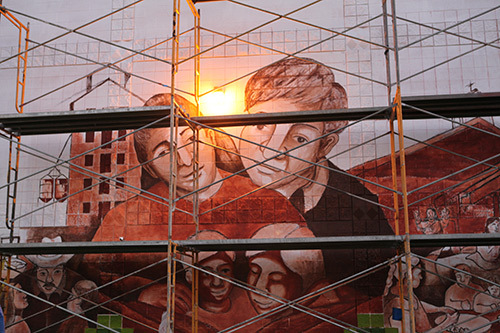 The photo above of a mural in progress, by Jaime Montiel, 2012 artist-in-residence at TANA, was created in the Fresno County community of San Joaquin. In the current political climate, understanding and valuing Chicanx/Latinx community experiences are important for Aggies wanting to be leaders with impact. When you are a Chicana/o studies major, you become steeped in the history of cultural representations and socio-economic realities. You work closely with professors dedicated to fostering excellent student research. And you join an academic department devoted to supporting community service. Our students leave UC Davis with a strong education in the use of cultural expression as well as in theory and analysis of the intersection of race, class, gender and sexuality. Specifically, they examine the historical, social, political and ideological forces that shape Chicanx culture and identity. Our faculty — internationally recognized for its contributions to Latin American and Chicanx scholarship, public policy and community relations — is helping them on this path. 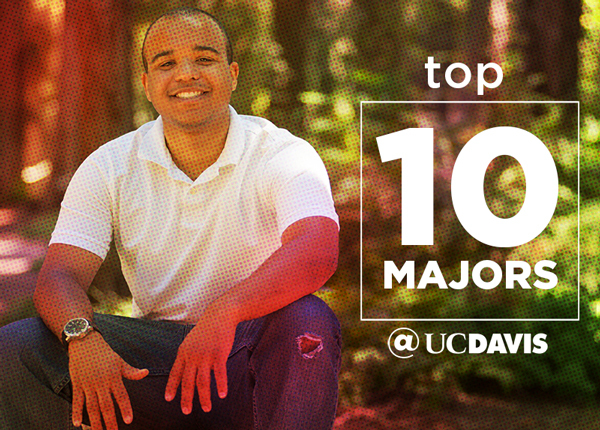 And our department staff supports our students in finding success at UC Davis and beyond. Majors can choose either the cultural studies track or the social/policy studies track. The cultural studies track incorporates more literature, culture and the arts (including artistic expression and analysis). Students find this track to be flexible enough to accommodate careers in bilingual and English-language education, anthropology, health narratives, women and ethnic cultural programs, and Chicana/Latina studies. Or, alumni can pursue in graduate studies in art, cultural studies, communications and literature. Chucha Marquez ’13, double majored in Chicana/o studies on the cultural studies track and psychology, with a minor in art studio. They are the social media and public relations coordinator at CultureStrike and a freelance artist. The social/policy studies track emphasizes society, political economy, community and family. Students opting for this track will get solid preparation for work in migrant and bilingual education, cross-cultural settings, human service delivery, community development, public-service or advocacy work. They also can use this education for further study in communications, health services, social welfare, psychology, social sciences and political sciences. Students interested in pre-med, pre-law or other fields of interest have sufficient flexibility with elective units to pursue double majors or minors to prepare for professional school study. Alumna Ana Maciel ’16 is attending the University of San Francisco for her master’s in higher education and student affairs. She doubled majored in Chicana/o studies, and gender, sexuality and women’s studies at UC Davis. Ana wants to work in institutions of higher education to expand educational access to undocumented students. Our overall curriculum provides students with a solid basis in theoretical and applied analysis covering quantitative, qualitative and critical methods of study. A minor in Chicana/o studies is useful for students who intend to work in bicultural settings where knowledge about the Chicanx and or Latinx community is important. Students also elect to get a minor in the subject to fulfill breadth requirements. What happens to our majors? Maria Salazar ’16 exemplifies the flexibility of being a Chicana/o studies major. She earned a double major in Chicana/o studies and psychology, with a minor in social and ethnic relations. Maria works as a community development specialist for a nonprofit that helps provide low-income housing and clean, safe, sustainable water systems mostly for farmworkers and Latina/o immigrants in the Central Valley. She plans to further her education with a master’s degree in psychological counseling and marriage and family therapy. Olivia Hernandez ’13 reflects the strength of our next generation. She obtained two bachelor's degrees, one in Chicana/o studies and the other in art studio. Currently Olivia serves as a staff program coordinator for the Cross Cultural Center at UC Davis, where she uses her artistic skills, vibrant personality and representation to advocate and empower different communities and promote radical change and growth. Lisceth Brazil-Cruz ’05 was a double major in Chicana/o studies and international relations with a minor in education. She earned a Ph.D. from the School of Education in in educational policy and school organization. Lisceth is currently a postdoctoral scholar with a dual appointment in the UC Davis Betty Irene Moore School of Nursing and the Department of Chicana/o Studies collaborating with Professor Yvette Flores on the UC Davis Advance Initiative in the College of Engineering. Currently, her research focuses on understanding the predictive and protective factors that promote women of color in STEM fields. Additionally, she is researching access to health and education resources for migrant women. Lisceth says she is committed to increasing the number of underrepresented and underserved communities in graduate and professional school both through research and institutional practice. Michelle Villegas ’12, a double major in Chicana/o studies and psychology and a minor in global studies, previously worked in human resources for the California State Assembly and in a job focused on youth empowerment. Calling herself a “Salvadoran Chicana from Los Angeles,” this Aggie will receive her law degree in 2018 and plans to practice in public interest within the blossoming field of “crimmigration,” where criminal and immigration law meet. Michael Yepez ’16, a double major in Chicana/o studies and communication, is originally from Littlerock, California. He is pursuing a Master of Science degree in higher education at California State University, Fullerton, while working as a graduate research assistant at the Center for Research on Education Access and Leadership on the Fullerton campus. Gilda Posada ’11, a double major in Chicana/o studies and comparative literature, was born and raised in southeast Los Angeles. She attained her M.F.A. in social practice and M.A. in visual and critical studies from California College of the Arts in San Francisco. She is currently a Ph.D. student in the history of art at Cornell University. Natalia Deeb Sossa is an associate professor in the Department of Chicana/o Studies. She researches medical sociology, social psychology, symbolic interaction, race, class and gender, and methodology. All of her work is focused on issues in inequality.